Whenever a client replied that he could not turn up for our appointment, instead of being upset over the cancellation of the meeting, I sent them this message... "Successful people are always busy! I'm glad you are one". I'm sure they would smile reading this compliment, and they never failed to make good for another appointment with me again. If ever I had the chance to explain that message to my clients, the logic is... Successful people are intelligence and creative. Their minds are constantly thinking without a rest, except in the late night. Being intelligence they know how to maximise their time and being creative they have fantastic ideas that many people like meeting them. They are usually very active and full of enthusiasm in whatever they intend to conduct. They seldom allow time to drain off without a reason. Because every minute is pleasurable and meaningful to them. So! If you are one who considered as a busy person, you should give yourself a good pat on your shoulder. Because you are definitely a successful person. Congratulation!!! Food for thought - "Success usually comes to those who are too busy to be looking for it" - Henry David Thoreau quotes. Busy is good but when busy becomes a reason used too often, it'll be like an excuse. Just a thought of my mind. You are totally right. 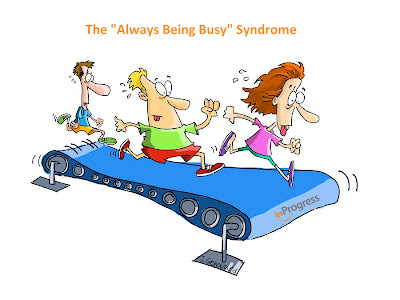 Most people used the excuse of busy to avoid meeting others. Otherwise busy person is always a successful one.